"Discover The Secrets To Turbo Charging Your Advertising, Skyrocketing YourResponse Rates and Attracting All The New Customers You'll Ever Need... Guaranteed!" How To Get All the New Customers and Hot Leads You’ll Ever Need… Guaranteed! If you want to seriously fatten up your bank account and flood your business with all the new customers it can possibly handle, this will be the most important message you’ll ever read! 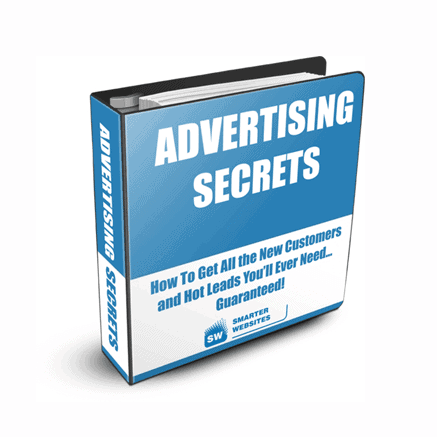 Here’s why: One of Australia’s hottest ad writers and marketing experts, Alexi Neocleous, has just released a brand new 184 page home study course called, Advertising Secrets: How To Get All The New Customers and Hot Leads You’ll Ever Need… Guaranteed! For the first ever time, Alexi reveals the secrets and strategies he uses to write money making ads and sales letters… every time! If you want to put your advertising into overdrive you’ve got to check it out. Why you are only one good sales letter away from having all the money you need! 6 cash generating tips guaranteed to make your prospects take immediate action! The basics of writing good ads! The finer points of writing great ads! Which option pulls best… telephone, mail or fax? You’ll never guess the answer which will surprise and enrich you beyond belief! Two “magic words” that can quadruple the response of your ads… overnight! Why competing on price alone will put you out of business in a heartbeat… and how to persuade your customers to happily buy what you’re selling… even if you’re more expensive! How to make a 15-second change to almost any sales message which sometimes increases responses by 2,200%! How to make your Yellow Pages ad as much as 750% more profitable! The most important component of an ad… and… how to make a slight change to increase your results up to 500%! How to start your ads to get your prospect’s attention, and the insider secrets to keep them glued to YOUR ad any time of the day! The secret technique that instantly doubles the profit of your full-page ads! How to get orders from people who have already decided not to order! The real reasons why people don’t buy from you… and what you can do about it! How to turn refunds and complaints into sales! How to totally eliminate all doubt and skepticism from the mind of your prospects! 3 insider secrets to making your prospects get off their butts… whip out their wallets… and give you their money NOW! How to ferret out the real reason why people buy from your competition… and not you! How to write cash generating ads… even if you failed English in high school! The 10 biggest advertising mistakes you can make and why they’re costing you money! The 4 most important and overlooked questions to ask before you can write money making ads and sales letters! The 9 steps you must follow to write emotion filled, profit generating ads and sales letters that your prospects can’t resist… know matter how hard they try! 8 proven ways to make your ads scream out to your prospects, demand their attention and leave your competition in the dust! How to multiply the pulling power of your ads with ‘credibility boosters’ so your prospects believe every word you say! How to make your prospect’s mouth salivate with overwhelming desire for YOUR product… and to take action now! The #1 ‘hidden reason’ why people don’t respond to your ads… and how you can guarantee the cash register rings every time! 13 amazing ‘trade secrets’ you can use to rivet your prospects to your ads! How to make an offer that overcomes all buyer resistance… and leaves your prospect gasping in disbelief! A real life analysis and ‘critique’ of ads and how you can discover my simple secrets for multiplying the profitability of any ad! Have you ever seen or heard of a book that offers so much practical and proven ideas for making bushels of money in your business? “Advertising Secrets: How To Get All The New Customers and Hot Leads You’ll Ever Need… Guaranteed!” will show you precisely how to flood your business with more new customers, multiply your profits and totally crush your competition… without reducing your prices or resorting to low ball, unethical ‘hard sell’ tactics! If you know of, or have heard of Alexi then you may just want to cut straight to the chase and buy it right now.